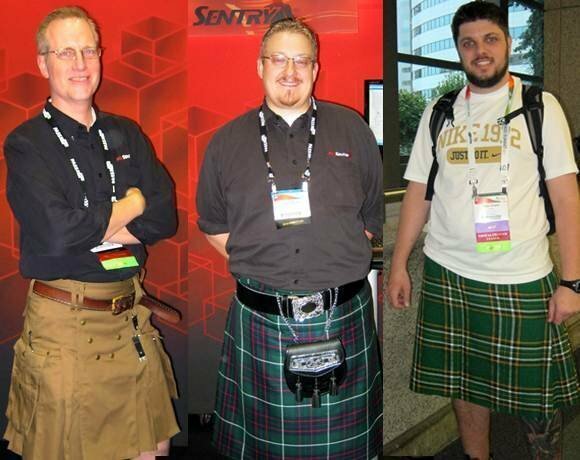 CENTER: Steven Wright, director of engineering at SQL Sentry, wears the official tartan of the clan MacIntyre at the company’s booth. Wright, whose family is Scottish, bought his kilt long before the PASS tradition got under way and dons it each year on National Tartan Day on April 6. LEFT: Diego Nogare, a database developer with SQL Server training company SolidQ in Sao Paulo, Brazil, bought a kilt on eBay and had it sent to his hotel in Seattle. “Last year I heard some things about SQL Kilt Day and I made a joke with my friends,” Nogare said. “‘I will wear a kilt. I will do it!’ ” To prove it, Nogare used social media site Twitter to send his buddies a picture of himself in a kilt.